This morning, after more than two weeks of ‘horse trading’ and negotiating the final packages for inclusion in the FY2016 Appropriations spending bill – Congress released the 2009 page federal budget which will be signed by President Obama once Congress votes for final approval expected later this week. Provisions to both prevent horse slaughter operations from resuming on U.S. soil and protections for wild horses, were included in the 2016 Appropriations Act! A few months ago, the Udall amendment in the Senate inserted the defund language to the agriculture appropriations bill, but while it was accepted in the Senate, it was not accepted in the House of Representatives. Unrelenting response from the general public, celebrities, corporate giants and entrepreneurs maintained pressure on their elected officials to protect America’s horses with language in the bill; preventing federal funding for both horse slaughter operations (page 108) and, “the destruction of healthy, unadopted, wild horses and burros in the care of the Bureau (of Land Management) or its contractors or for the sale of wild horses and burros that results in their destruction for processing into commercial product”, page 714. “This is a strong statement about how Americans feel about horses,” said Neda DeMayo, President of Return to Freedom, a wild horse sanctuary and preservation organization. ” Return to Freedom applauds Congress for including provisions to protect America’s horses in the 2016 budget bill. The vast majority of Americans want to see our wild horses free on the range and off the table”, DeMayo continued. 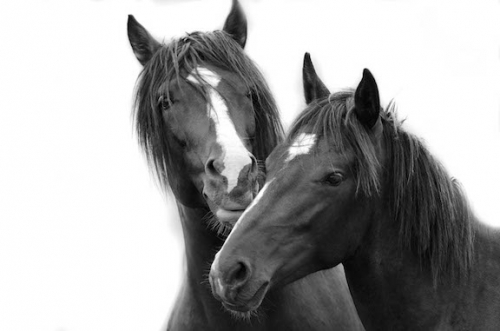 Horse lovers are somewhat split on horse slaughter operations resuming on U.S. soil. Without legislation prohibiting the sale and transport of America’s horses over our borders by land, air or sea, to be slaughtered in Canada, Mexico, Europe and Asia, America’s wild and domestic horses still remain vulnerable to horrible pain and suffering. But what a majority of American’s do agree on is ending the slaughter of America’s wild and domestic horses once and for all- including the prohibition of the sale and transport of America’s horses over our borders to be slaughtered as a food commodity. “This a major victory for America’s horses, Congress heard us loud and clear and we are grateful for that, but there is more to be done to protect America’s horses”, said Wendie Malick, renowned comedienne, actress and equine advocate. “The fight to protect America’s horses from the barbaric and unnecessary suffering from horse slaughter, is in our hands. We hope all Americans who care about this issue will contact their Representatives in Congress and urge them to support the SAFE ACT, (HR 1942 in the Senate and H.R. 1094 in the House), to stop horse slaughter and the sale and transport of horses for slaughter, once and for all “, Malick continued. Return to Freedom’s mission is to preserve the freedom, diversity, and habitat of America’s wild horses and burros through sanctuary, education, advocacy and conservation, while enriching the human spirit through direct experience with the natural world. Since 1998, RTF has been dedicated to modeling and advocating for viable solutions to manage wild horses and burros on the range as an alternative to the costly and traumatic capture and warehousing of wild horses. RTF founded and supported a campaign and coalition of more than 50 organizations nationwide collectively representing more than 9 million grassroots advocacy for wild horse preservation. RTF advocates on behalf of wild horses and burros for their preservation on the range, for their protection from slaughter and for their protection from emotional and physical suffering during and after roundups and capture. Consolidated Appropriations Act, 2016 – See page 108 pertaining to horse slaughter and Page 714 regarding wild horses.